I'm planning a weekend getaway to Harbor Country in a few weeks and am looking for some suggestions of area restaurants and/or other activities. Our innkeeper (we're staying in Sawyer) suggested Zoe's Gourmet in New Buffalo and Fitzgerald's. I'd like to stay away from tourist spots if possible and would instead prefer homemade, high quality. fresh food. I did find an old thread for New Buffalo area spots but it looks very outdated. bottom one is the SW Michigan area in general. That's pretty much as recent and comprehensive as it gets. In terms of restaurants, Stop 50 is a must-try if you can, and there's not much more that really stands out. Oink's ice cream is a little touristy and kitschy, but perhaps worth checking out. You'll also probably want to stay away from Redamak's-not so healthy and pretty packed. The farmer's markets in the area have the highest quality food one can get, so I wouldn't count out cooking a meal. I would look into mudsliding at Warren Dunes as a possible activity. I don't know how adventurous you are, but tucked into the woods to the south of the beach is a popular spot to slide down a slope of mud. It's not much of a secret, especially because there are usually a few people on the beach coated with mud. Going to the Round Barn winery is also cool- you can taste local wines, at...(no surprise) a round barn. I've only been a few times to the area--specifically Union Pier. Did eat at Soe and thought it was good. Upscale casual, good food. Service a little slow. But so is the pace in the area. Highly recommend Red Arrow Roadhouse--alot better than the name sounds. Nothing spectacular inside but the food is very good. High quality roadhouse/diner food. Have gone each of the few times we've stayed in the area. Of course, there's always Redemaks. You go for the burger. Ill add Violas in Three Oaks for breakfast. Been twice and enjoyed greatly both times. Also Timothy's in Union Pier--upscale, good fish. Last edited by aviva5675 on May 23rd, 2008, 4:33 am, edited 2 times in total. Fitzgeralds - located in sawyer (a bit north of new buffalo) - offers a pretty good craft beer selection in a nice but stress-free environment. Menu has a great range from 8.75 fish and chips to some great french inspired dished. 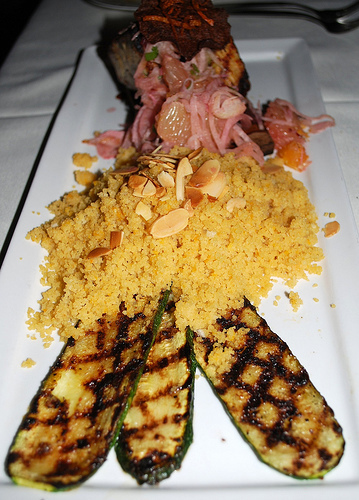 If you want high end, check out Timothy's at the Gordon Beach Inn. Also worth mentioning is Bentwood tavern in New Buffalo. Great contemporary American food in a nice spot. Worth the 23.00 price of admission alone. It was carved to order, and then fire-roasted to requested doneness if desired. Right at the carving station it was mostly med rare. Um, my mouth is watering just writing about this. No joke. I got to the seafood section just as these were placed in the warming trays. They were cooked to a med rare, and just plain out delicious. Simply seasoned (salt/pepper/garlic) but done right. again, the mouth is watering. Yup. You heard me. This was good. not great. If I'm evaluating bbq, good is pretty high praise - especially for brisket. NOW, here was the deal. They had sections for Asian, American, BBQ, Seafood, Mexican, pasta, salad, desert, bread, and probably more that I'm forgetting. Of our party of 6, four had eaten at other big name casino buffets in the Chicagoland area, and all agreed hands fown that the Four Winds blew them all away..and easily. I was seriously impressed with this place. Yes, it's a casino, and the touristy factore was pretty much as high as it can be, but we've pretty much agreed that this will be our regular dinner destination for our fishing trips from here on out. I've never been a big fan of buffets, and was really not looking forward to this place, and generally was ready for a huge letdown. The Four Winds rocked our world. Yeah, Bruce and I had a few positive things to say about 4 Winds' food when the casino first opened. It's interesting that they have just now started to really advertise in Chicago. Looks like they wanted to get up to speed first and, besides, beach season is upon us. I am not a huge casino fan, though I appreciate Vegas and enjoy an evening of craps now and again. One thing should be made clear: 4 Winds is not puffing or boasting when they claim that this is the closest thing to a Vegas Strip casino you are going to find somewhere not on the Vegas strip. It has a large floor, nice bars and restaurants, etc. It really could be an upper-middling casino in Vegas, which might sound like damnation by faint praise but isn't. The North Woods theme is appropriate and low key, and the physical plant fits into the natural setting surprisingly well. It will be a challenge to keep the place classy, I predict, but it sort of is now. I could actually see the place becoming a decent weekend getaway destination for Chicagoans not addicted to the slots, especially if they were to do something creative like investing in some nearby beachfront and creating a beach club for guests, hooking up with one of the great but underused local golf clubs (i.e., Lost Dunes), etc. Sorry to digress. I'm a poor man's Wynn. Hesston's in La Porte is a good spot. Prime Rib is outstanding and my wife had the biggest piece of Lobster I have ever scene.....all for a reasonable price. Fantastic cheddar spread. Great bar, but it can be a bit precarious navigating the roads as it is out of the way. Look it up and you won't be discouraged. Thanks for all of your suggestions! Here's a run-down of our trip. Of course, our trip to Harbor Country wouldn’t be complete without visiting our share of the local restaurants. After our arrival Friday evening, we visited the Bentwood Tavern at the Marina Grand Resort in New Buffalo. 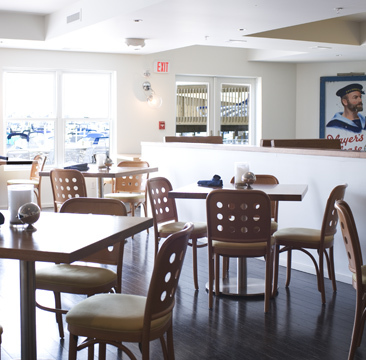 Touted by the Tribune as “the area’s newest restaurant and arguably, its best,” Bentwood is a waterfront eatery featuring fresh seafood, locally grown ingredients and sophisticated decor. We started with a tasty but predictable salad of greens, goat cheese and dried cherries. I had the fish and chips (fresh, flaky cod served with tangy and perfectly dressed coleslaw) and Aaron enjoyed roasted Amish chicken with a spicy sweet and sour sauce. Bentwood Tavern, Harbor Country MI. 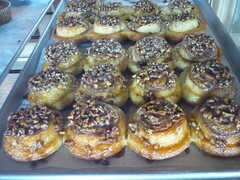 The next morning, we ventured down Red Arrow Highway to Harbert Swedish Bakery/Luisa’s Café for breakfast. After chatting with the owner of the bakery, I learned that the business has been one of Harbert’s best known exports since the early 1900’s. 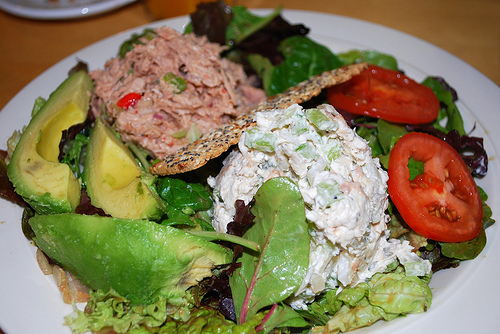 Luisa’s, owned by the same family who currently run the bakery, serves breakfast and lunch items like Swedish pancakes, organic salads, and sandwiches made with just baked bread. 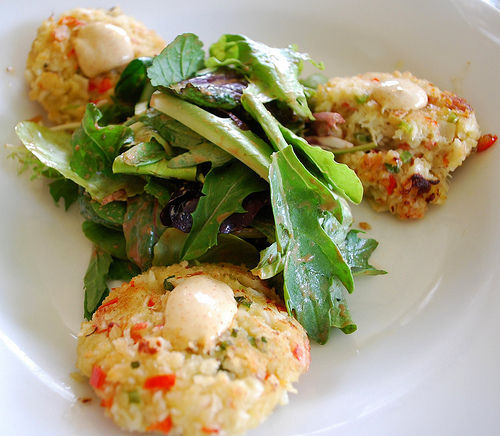 For lunch, I had a crab cake salad, which Aaron longed for enviously. The cakes were perfect; large pieces of lump crab with minimal filling served with a spicy aioli. Aaron stuck to a simple omelet with goat cheese, spinach and mushrooms. After lunch, we explored Warren Dunes State Park (or to be more accurate, I climbed half-way up a dune and then watched Aaron leap like a man-deer all the way down). Once we had our fill of sand and sun, we took off on Harbor Country’s wine trail. Round Barn Winery’s wine was forgettable, but we were enamored with its DiVine Vodka. Apparently, its only one of four vodkas in the world produced with grapes. We were also very impressed with Hickory Creek Winery, tucked away among beautiful rolling hills and bright green farmland. One of the co-owners, Gottfried, was extremely gracious and his hospitality added to our tasting experience. Hickory Creek’s show stopper is certainly their slightly creamy and toasty 2005 Chardonnay. The flavors of honeydew, melon and Gala apple marry together and are balanced by a hint of lime. 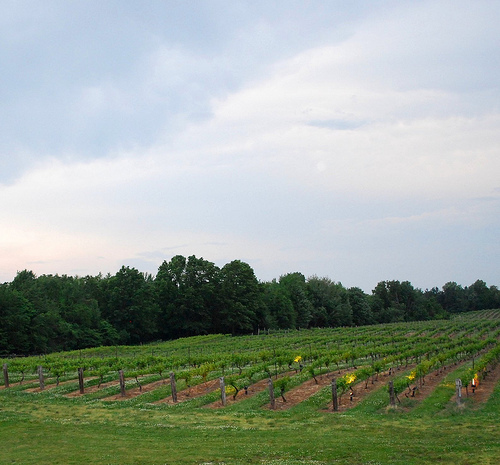 At the recommendation of our innkeeper, we stayed on the wine trail for dinner and drove to Tabor Hill Winery. Tabor Hill is the only winery on the trail that also doubles as a restaurant-not necessarily a good thing. While the ambiance was beautiful, the food was a bit heavy-handed and extremely overpriced. Our starter, yet another crab cake, was hardly as delicate or as flavorful as Luisa’s. It was also accompanied by a bizarre orange juice, cherry juice, herb and wine reduction sauce which completely marred the simplicity of the crab. 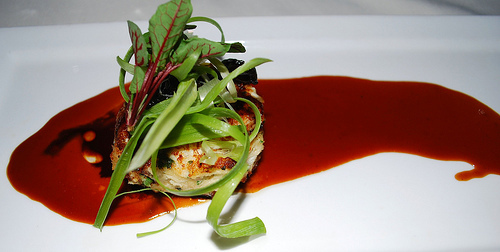 Crab Cake, Tabor Hill Winery. 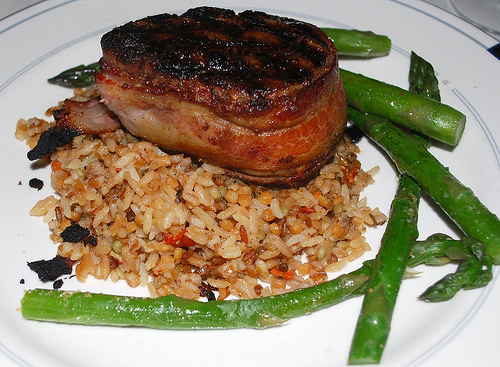 Filet Mignon wrapped in apple-smoked bacon was perfectly cooked, but sloppily presented. An extremely under-seasoned and underwhelming Alder Wood Smoked Hawaiian Swordfish was somewhat saved by its accompanying salsa of grapefruit and zesty ginger. Thankfully, we did enjoy Tabor Hill’s 2006 Lake Michigan Shore Cabernet Franc, a lush, soft, fruit-driven and elegant wine. Filet Mignon, Tabor Hill Winery. The next day, our final Michigan feast took place at Blue Plate Café, also located on a stretch of the Red Arrow Highway. 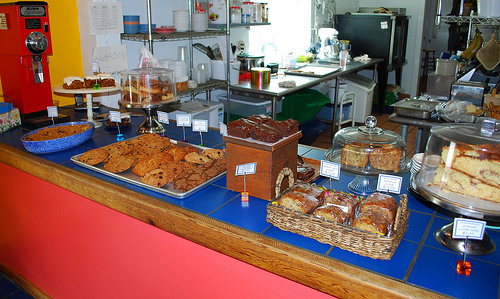 Blue Plate is a funky little place that’s open for breakfast and lunch. Most of the customers seemed to know each other, and thus the atmosphere was friendly and laid-back. Complimentary samples of chocolate chip banana bread started things out on the right foot. Our lunch selections of a salad plate with so-so tuna salad and phenomenal chicken salad and scrambled eggs wrapped in tortillas with Verde sauce were fresh, light, and satisfying for our journey home. Salad Plate, Blue Plate Cafe. 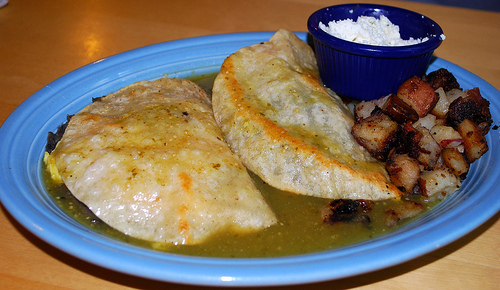 Scrambled Eggs in Tortilla with Verde Sauce, Blue Plate Cafe. Sounds like a great weekend, you covered a lot of ground efficiently. The wines of southwest Michigan have really made some great strides the last few years. You hit one of my two favorites, Hickory Creek. They also make a nice riesling, which seems to be the grape that most vintners in the state have the best luck with. Next time check out Free Run Cellars, it's also in the area. This is the only place in Michigan that has figured out how to make a good red wine. We were just up in Leelanau and Old Mission Peninsula and made the wine circuit up there...if you like red wine, you've got to kiss an awful lot of frogs to find something decent in this state. Fast Eddie wrote: ...if you like red wine, you've got to kiss an awful lot of frogs to find something decent in this state. I think that, even more than riesling, the one grape they can grow successfully in Michigan is cab franc. So if I'm drinking a local red, I'll typically reach for either a straight cab franc or cab franc blend. Cabernet Franc is a blending grape, and there's a reason it's usually only used for blending a good wine. I'm headed up for a week in Leelanau week after next. What wines and wineries would you recommend up there? I've put L. Mawby on the agenda based on past tastings. From the ones we visited, Peninsula Cellars (on the Old Mission Peninsula) was far and away our favorite for quality of the wine. We brought back a mixed case and are still enjoying that. We really liked the sparkling riesling at Mawby too, and they've got that great outdoor tasting area. We tried to visit Bel Lago, but for some reason their tasting room was closed even though we went during posted hours. I've had their wine at a restaurant, and it's pretty good. We didn't hit all of the rest, but from the other ones we did visit I'd lump them together as unmemorable for the wine (but you can't beat the scenery). Make sure you have dinner at Stella in Traverse City. The food was excellent, and on top of that you can then say you've had the experience of eating in an inmate's cell in the basement of a former lunatic asylum - makes for good cocktail party chatter, I've gotten a lot of mileage out of that one. Thanks for the tips! We hit Stella last year and we enjoyed it too. Probably won't make it this time--the 7-month-old goes to bed too early! do NOT miss Cranes Pie Pantry- Fabulous! Tried Red Arrow Roadhouse, recommended twice upthread. In Union Pier, just a little north of New Buffalo (a couple of public-access beaches are nearby). Solid choice. Prices a little high for what you get; I blame the affluent seasonal property owners in the area. Not too bad, though. Very good onion rings. Wife wouldn't let me near her broiled whitefish with bubbly Parmesan topping--the house specialty. The cod in my fish and chips was a bit greasy, but fresh. Nice assortment of greens in the salads. Key Lime Pie a bit too much like cheesecake for my taste, but fine if you like that style. Service was quite good, and it was nice to see the owner tidying up the outside entrance area before dinner rush. Seemed a notch or two above the average place in the region. Note: Don't be spooked by the name; this place is fine for kids. A very tame version of a roadhouse. Last edited by TomInSkokie on September 18th, 2010, 3:06 pm, edited 1 time in total. Please help! I am going to be in Union Pier next weekend and need to find a bakery from which I can pre-order a birthday cake to be picked up on Saturday, September 18 (or, at the least, from which to pick up a pretty and tasty readymade/pre-made cake on that day). I looked at the Harbert's website but their wares do not seem to include traditional cake (only coffeecake-type pastries). The cake only needs to feed 6 people, and I am looking for a more European-style cake rather than a supermarket sheet cake, if that makes sense. What are the best bakeries/patisseries in the area for cakes? Thanks in advance for the help. 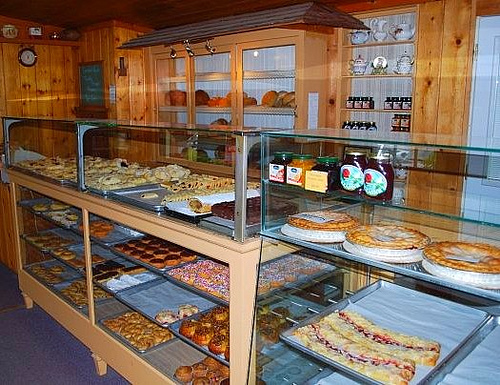 Bit o Swiss in Stevensville is the best bakery in the area (IMHO).I really can't promise you they do cakes but I don't see why not.The Flour Shop in downtown New Buffalo does cakes. They get their product from the Flour Shop in Stevensville.Truffles which is excellent on about 9th street and Franklin in Michigan City.I recently got one for my wife there which she loved.I am sorry I don't have the ability to get you links now.I don't know if Ramberg's Bakery in Union Pier does cakes. Bit O Swiss and Truffles probably give the best option for a European style. I love the area (especially Stop 50, the orchards, and Tabor Hill), but have always done it as a daytrip. Any current recs for places to stay in or just outside (north) of Harbor Country? Quiet and natural setting a plus, but we'll take anything with friendly proprietors or access to good food. I noticed the White Rabbit and the Inn at Union Pier in other threads. Santander wrote: I love the area (especially Stop 50, the orchards, and Tabor Hill), but have always done it as a daytrip. Any current recs for places to stay in or just outside (north) of Harbor Country? Quiet and natural setting a plus, but we'll take anything with friendly proprietors or access to good food. I noticed the White Rabbit and the Inn at Union Pier in other threads. We've stayed at both White Rabbit and at the Gordon Beach Inn. White Rabbit was smaller and more intimate, while Gordon Beach had some great antiques and a nice lobby to hang out in. It's much larger. We didn't eat at either place (except for Gordon Beach Inn when Fanny's used to be the in-house restaurant). Thank you for the recs, Steve and vgudas. Since we're bringing the kiddo we've decided on the Harbor Grand, but Harbert House looks just right when he's older, and the others for when just the two of us get away. I'll report on any finds or good meals. Santander wrote: Thank you for the recs, Steve and vgudas. Since we're bringing the kiddo we've decided on the Harbor Grand, but Harbert House looks just right when he's older, and the others for when just the two of us get away. I'll report on any finds or good meals. We've eaten at The Stray Dog, which is in the Harbor Grand, IIRC. It was acceptable pub grub. Thay make a decent, while not mind blowing, burger, etc. It's a good place if you have a kid. The Stray Dog is a stand alone restaurant on the beach side of the RR tracks on Whitaker Street.The Bentwood restaurant is in the Marina Grand Hotel near the Harbor Grand. I spent a day in Harbor Country a couple weeks back. Spent it at Warren Dunes to be exact. Just take the Skyway exit at Detroit/Lake Station go towards Michigan and exit at stop 16 (hour and a half). What a great way to spend the day. One of America's better beaches. Super soft sand, fresh water not salt, it's the way I like it. Pack a cooler and bring sandwiches from your favorite Chicago deli or stop in at one of the spots along the Red Arrow Highway and pick up some stuff to bring into the park with you. After the beach we stopped in at a few places but you could also easily do these spots before. No glass bottles aloud. 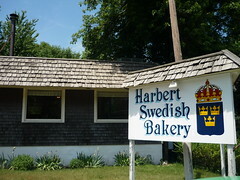 Harbert Swedish Bakery has been doc'd on LTH before. Just down the road from the beach on Red Arrow, what a great little bakery to pick all sorts of goodies to bring to the beach. The cherry cream cheese coffee cake I brought back was great. 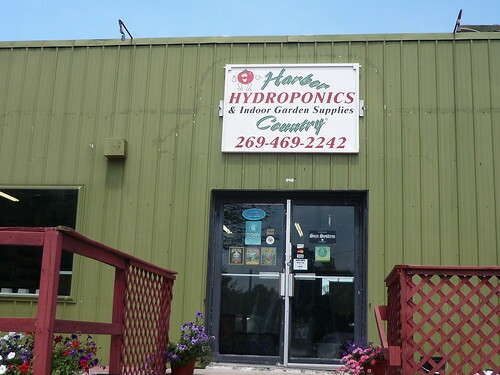 We also stopped into Barney's Grocery Store in New Buffalo, also located on Red Arrow. I've been eating their broasted chicken since I was a kid. We got some fresh out the compression fryer and it was the best from there I have ever had. Nice place to shop at if your staying in the area. They have great meats, lots of good beer selections and really good prepared foods like the chicken. 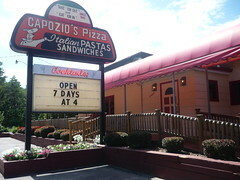 Also as I checked my SW Michigan to post these pic, I found some pics from the pizza place Capozio's. Must of been a couple years back when I stopped in. We passed it again on my last trip and I remembered the place. 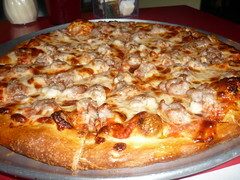 Looks great from outside, been around since 1945 but you wont get that signature Midwest, tavern thin, cut in squares. 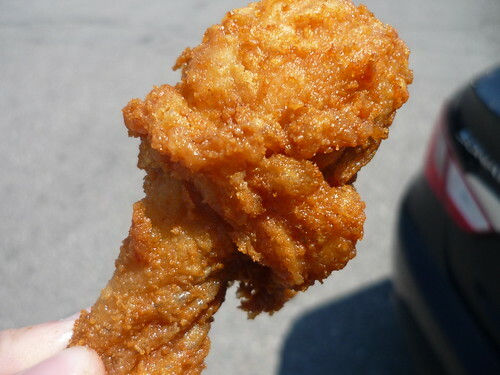 I was in a parking lot in New Buffalo, going into the drug store when I caught the aroma of fried chicken. Like a scene out of a cartoon, I floated across the parking lot to find the source. As I followed my nose, it was leading me to a grocery store called Barney's. I walked in and found the chicken. As I had just eaten lunch, I wasn't really hungry, but I HAD to try this chicken. I bought one breast and ate it in the car. It was one of the best pieces of fried (broasted) chicken I ever had. So here's my dilemma. I don't like New Buffalo's beach because it's way too crowded (I prefer Warren Dunes or Silver Beach in St. Joseph). I just wanted to find a nice park (very close to Barney's) to eat lunch, but I couldn't find one. Does anyone know a small spot to eat outside in New Buffalo that is NOT so close to where all the people go? 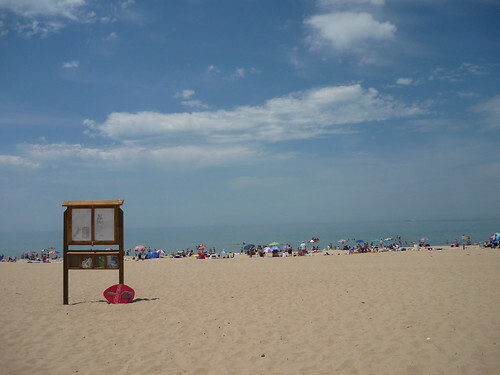 My favorite beach is just north of Warren Dunes - Weko Beach in Bridgman, $7 a car in the summer and very civilized. It is the beach we stop at to eat during our drives up to Crystal Lake and environs... There is going to be a Brewery Fest there this fall. If you want to eat outside in New Buffalo you can walk over the bridge and there are numerous picnic benches in the park and under the pavillion. Across the street near the bridge is the "transient dock". There are benches to sit in the area or sit on the lawn.Most docks in the harbor have an outdoor table if no is around that dock grab a seat and eat. Drive just a few blocks toward Redamaks turn at Bronson south a couple of blocks there is a park right by the high school where the little league softball fields there are places to sit down. Head further north on red arrow to the township park where the township office and fire department are.There are some park things going on there. Head further north to Union Pier and turn left at the flashing yellow lights to the lake.There are plenty of parking spaces just dont block a drive way.There are non enforceable no parking signs don't pay attention since you will be very near your car.There are some benches on the landing for the stairs heading to the lake which would be a nice place to eat. The bottom line is on Saturdays and Sundays in season the places are crowded the other times you have the town to yourself (well almost).